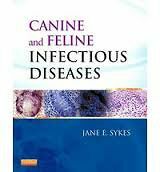 Canine and Feline Infectious Diseases is a practical, up-to-date resource covering the most important and cutting-edge advances in the field. Presented by a seasoned educator in a concise, highly visual format, this innovative guide keeps you current with the latest advances in this ever-changing field. 80 case studies illustrate the clinical relevance of the major infectious disease chapters. Well-organized Major Infectious Diseases chapters break down content by etiologic agent and epidemiology, clinical signs and their pathophysiology, physical examination findings, diagnosis, treatment and prognosis, immunity, prevention, and public health implications. Over 80 case studies illustrate how the information provided can be applied in everyday practice. Logical approach to laboratory diagnosis guides you through all the steps needed to accurately diagnose and treat viral, bacterial, fungal, protozoal, and algal diseases. Practical protocols provided by expert clinicians guide you in the management of canine and feline patients suspected to have infectious diseases, including handling, disinfection, isolation, and vaccination protocols. Over 500 full color images - geographic distribution maps, life cycle drawings, and hundreds of color photographs - visually illustrate and clarify complex issues. Easy-to-understand tables and boxes make content quickly accessible, eliminating the need to sort through dense text for critical information in the clinical setting.